Released October 2011. 4 episodes. Roots: As related by the Doctor, the real Turk was a fake chess-playing automaton, existing from the late Eighteenth century to the mid-Nineteenth century. Frankenstein, both the novel ("Run to the north Pole - we'll still be at your heels!") and the movie (Mary gets to use the line "It's Alive!") - Gram also plunders morgues for parts for Drossel and seeks lightning to revive Brem. The Doctor calls his puppet self "Pinocchio in fancy dress". The framing lullaby is sung to the tune of Silent Night. Drossel's puppets are named after the pantomime characters Columbine and Pierrot. The 'Turk' plays Beethoven's Moonlight. The Nutcracker (Herr Drossel as a corruption of the ballet's toymaker Drosselmeyer). Goofs: Actress Claire Wyatt (Mitzi Bittenmeijer) sounds a lot like Julie Cox (Mary), unfortunately. Dialogue Triumphs: "Puppets don't move by themselves, someone has to pull the strings"
"This is my world... but the world has changed. Why have the people discarded their containment suits, why is this surface inhabited? The atmosphere is not frozen. There is a sun in the sky - has Mondas found a home? Is the Journey over?" "It is Heaven's rage, Brem. It will renew us." "Brem unit closed. Gram is alone. We begin again." "There is no logic here, Brem"
Double Entendres: "I demand satisfaction. I demand it!" 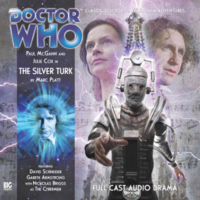 Continuity: Stahlbaum's 'Turk' is turbaned and moustachioed and can play chequers, chess, pianoforte and flute; ostensibly an automaton bound to a wheelchair with no visible controls, it is identified by the Doctor as "a Mondas original", and it is in reality the Cyberman Brem. Stahlbaum feeds it cabbage soup. Brem's response to stimulus is minimal - he is in pain and under sedation. His photo-cell eyes are original, but dead; its wooden arm was fashioned by Stahlbaum. Drossel's creature is another Cyberman, 'Gram' and has three legs growing from its shoulders (which it uses for movement) and a bandaged head, smooth and "shaped like a table vase." His actual legs were claimed lost in the crash, though in reality Drossel cut them off to prevent him escaping. Working for Drossel Gram makes his puppets to a lifelike degree, furnishing them with real human eyes. And wiring circuitry into them for independent movement and speech. Though he is ultimately unsuccessful (mistaking a potato for the real thing), Gram suggests that he can detect the sonic screwdriver in the Doctor's pocket. Both Brem and Gram were separated when their craft lost control and crashed in mountains where they were retrieved by a forester who then sold Brem to Stahlbaum. The Doctor says mesmerism is an old Cyberman trick, but as Brem is weak he is able to defend his mind. Mondas is two hundred light years away from Earth. The TARDIS workshop is three corridors and four doors down [from the console room?] and contains spare parts for the sonic screwdriver. This story begins only an hour after the events of Mary's Story from the Doctor and Mary's perspective. The Doctor initially believes that they have not left June 1816. Mary breaks the Doctor's sonic screwdriver. The Doctor is indifferent as the TARDIS has a room full of them. Mary is unfamilar with the term "science fiction". Mary's eyes are hazel, flecked with green. She carries a knife ("for sharpening my pencil") and smelling salts. The Doctor isn't carrying any money, but carries the anachronistic drug hyperethiodine, a general anaesthetic. He says it's some time since he went waltzing. He planned to bring the TARDIS back to the same day, week, month and year as agreed to be reunited with Samson and Gemma (see: Links) he says Mary's books "scared the pants off me." Untelevised Adventures: The Doctor refers to Beethoven as "Ludwig" (did they meet?) and the Empress [Elisabeth of Bavaria] "Cissy." He personally knows Franz Joseph I and Elisabeth. The Bottom Line: "Machines don't have secrets. Only the people who control them." The natural progression from Mary's Story, and an assured, emotionally worthy sequel - equal, even, to Platt's Spare Parts. Despite the former story being a riff on the Frankenstein origin, Turk offers a new spin again, with Mary sympathising with the monsters, and unwittingly writing herself into a model for her novel. The best dialogue, however, belongs to Gram, Mary's monster. Pathetic and lost, yet still possessing a ruthless and seductive streak, these Cybermen may be the most human yet from Big Finish, but it's a mark of the skill of Platt's writing that this fractured humanity strengthens them, rather than weakens their modus operandum. Platt simply gets the Cybermen in a way that no other Big Finish writer has attempted. On the down-side, the new theme tune is the very definition of a mixed bag, trying a quid each way between Debney and Gold, it's the real Frankenstein's monster of the piece.